Regarding "Kern vows to fight for morals in government; The legislator's anti-gay remarks drew ire earlier this year" (news story, Aug. 6): State Rep. Sally Kern describes herself as a "cultural warrior for Judeo-Christian values." Such claims should raise alarm bells for patriotic Americans. A free society can't be founded on Judeo-Christian principles. The Bible doesn't uphold capitalism, nor support our individual rights to life, liberty, property and the pursuit of happiness. It demands only that we suffer and sacrifice in obedience to God's will. 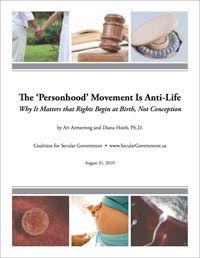 Individual rights are based on the objective requirements of human life in society. A person must be free to act on his own rational, independent judgment -- without forcible interference from others -- to survive and flourish. The only proper purpose of government is the protection of individual rights. For a government to do anything else -- including promote religion -- is tyranny. That's why a free society must, in the words of Thomas Jefferson, build "a wall of separation" between church and state. Kern and her fellow culture warriors seek to destroy that protective wall, thereby paving the way for a repressive theocracy. In the name of freedom, they must be opposed at every step. Hsieh is founder of the Coalition for Secular Government, which supports homosexual rights and opposes restrictions on abortion, tax exemptions for churches and government-sanctioned faith-based initiatives. The description of the Coalition -- written by the newspaper -- isn't fully accurate. As stated in our mission, the Coalition doesn't support homosexual rights: it opposes government discrimination against homosexuals. (That's a fine distinction, I know.) More importantly, the Coalition doesn't oppose tax exemptions for churches, but rather opposes any special exemptions from the tax laws governing all non-profits for churches. In any case, I'm delighted that they printed it.